We’d love your help. 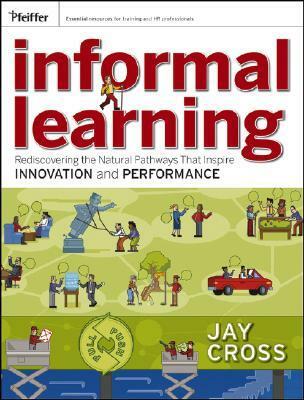 Let us know what’s wrong with this preview of Informal Learning by Jay Cross. 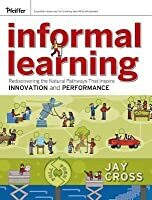 To ask other readers questions about Informal Learning, please sign up. In the Introduction, Cross makes a number of crisp assertions, several of which are certain to generate controversy. For example, "Workers learn more in the coffee room than in the classroom." Rather than take this out of context, I continue the excerpt: "They discover how to do their jobs through informal learning: asking the person in the next cubicle, trial and error, calling the help desk, working with people in the know, and joining the conversation. This is natural learning - learning from others when you feel the need to do so." So far, no pyrotechnics. Cross continues: "Training programs, workshops, and schools get the lion's share of the corporate budget for developing talent, despite the fact that...," and then, "this formal learning has almost no impact on job performance. And informal learning, the major source of knowledge transfer and innovation, is left to chance." Presumably several of those who read this review agree with Cross (as do I) that the value of formal learning tends to be exaggerated when, in fact, much of it has little (if any) enduring impact; and, that the value of informal learning tends to be underestimated when, in fact, the extent to which an organization achieves its objectives (whatever they may be) is determined almost entirely by how effectively those involved (at all levels and in all areas) communicate, cooperate, and collaborate (i.e. the Three Cs) on what must be done to achieve those objectives. For those in need of a single source to guide and inform their design and implementation of a knowledge exchange program that maximizes the Three Cs, Cross has written it. "Formal learning is like riding a bus: the driver decides where the bus is going; the passengers are along for the ride. Informal learning is like riding a bike: the rider chooses the destination, the speed, and the route." "Formal learning takes place in classrooms; informal learning happens in learnscapes, that is, a learning ecology. It's learning without borders." "Most training is built atop the pessimistic assumption that trainees are deficient, and training is the cure for what's broken." I agree. However, there are formal training programs now available as well as superb instructors to conduct them that can substantially improve various skills that include reading, reasoning, writing, public speaking, decision-making, problem-solving, and situation analysis. "Created long before knowledge work was invented, accounting values intangibles such as human capital at zero and counts training as an expense instead of an investment." "Imagine having an in-house learning and information environment as rich as the Internet. You'd have blogs, search, syndication, podcasts, mash-ups, and more. You'd also have a platform just about everyone already knows how to use. Management must assign enterprise-level accountability for learning." Cross is dead-on: Without proper governance, there would be chaos. Is Cross recommending a balance of learning with work? No. "As work and learning become one, good learning and good work become synonymous." •	The importance of the network, something that I believe in immensely, was highlighted again and again in this book and the power of the internet to connect more and more people is important. What you know is trumped by what the people you know, know. •	The book was quite anti-school in the traditional mind-numbing sense and I totally agree with this. Schools are on the whole geared to get the best grades so that more people, especially private schools can send their kids like sheep to those schools so that they get the best grades and therefore have the best chance of getting the best brain numbing rat raced jobs – all for the benjys. •	The book also bought up a Samuel butler-esque type of hypothetics which was good to see. What you know is always going to be trumped by the hypothetical situations your mind can manage the data to come up with. It’s not about knowing the facts, a monkey keying items into google can get more information that you can possibly know but how we are able to hypothesise with those facts is critical. •	The book spoke about the importance of reflection and reflection on what it is that you are reading most of the time. Jay cross, the author, talks about the need to carry a notebook but I simply put a lot of my thoughts down on the latest book that I am reading. •	Jam sessions were also discussed and we have had these at our company. They are simply 3 day online collaboration opportunities where individuals are able to discuss a whole plethora of subjects with one another on a single or multiple topics. Very good opportunity to get people from difference parts of the world to talk in a relatively cheap and effective manner. Do people learn best by sitting in a classroom taking notes? Not according to “eLearning” expert Jay Cross. 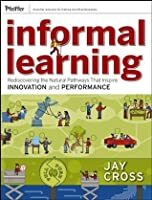 Instead, he says, companies should champion nontraditional, informal learning methods, including: “unconferences,” “unworkshops,” “eLearning,” “Courageous Conversations” and even “grokking” (sci-fi writer Robert A. Heinlein’s term for “instantaneous, holistic recognition” or understanding). Cross says properly presented informal learning programs can give your firm a better return on its training investment than formal learning. He explains why that is and how to use his approach. Despite some repetition and fluffy filler, getAbstract recommends this book to learning officers, training managers and human resources professionals who want to know more about setting up informal learning initiatives. rally nice one for getting some idea of participatory and informal learning. I would state Jay Cross as one of the most prominent forerunners of 21st century learning and learning environments. Good book to get some idea of the field of informal learning. A great read! Enjoyed the real life examples and forward thinking on empowering people with the resources conducive for effective learning!